Did you all have a wonderful holiday? I certainly hope so! As fun as it was, I’m more than ready for life to get back to its normal routine. The entire past month feels like an insane blur to me – our holiday party, a week of “vacation” that was mostly full of holiday-related tasks and errands, a weekend trip to Chicago, work while the rest of the fam was on vacation and the actual holiday – whew! For our annual holiday party, I generally try to do most of the food prep in advance, but this year I was determined to have essentially everything ready the night before the party. 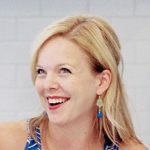 The morning of party day was the one and only day Santa would be visiting our favorite location to see him and I didn’t want to be rushing the kids or stressing about the party. With that in mind, I set out to make a party menu that would be amenable to advance prep. Empanadas were one of the first things that came to mind since they can be made and frozen ahead of time and baked just before the party. I posted about them on Instagram and had a few requests to share them before New Year’s Eve. You ask, I deliver! Though the advance prep does take some time, it’s fairly straightforward. 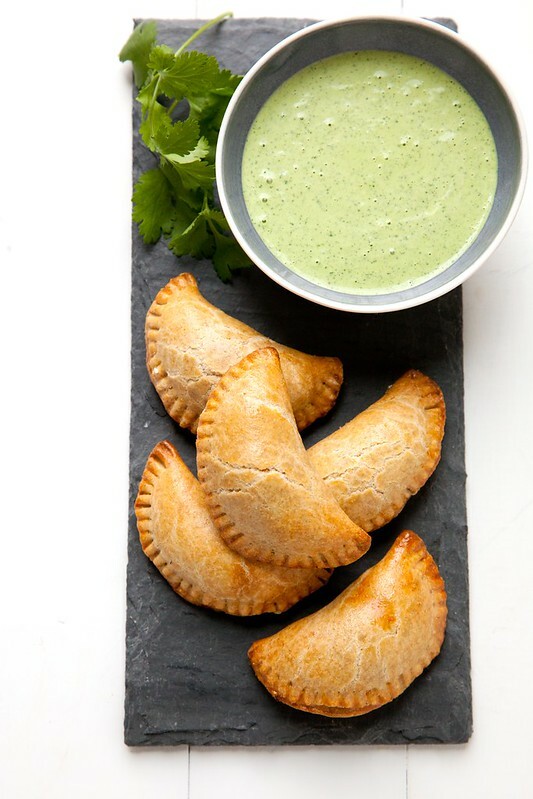 The empanada dough can be made in the food processor and the filling is basically a jumble of veggies roasted until tender in the oven. The up front effort definitely pays off later for effortless entertaining. When it’s go time, all you have to do is put the frozen empanadas on a baking sheet, brush with egg wash, and bake them until golden brown. I served them with the garlicky green sauce from this chicken because 1) it is awesome and 2) it goes with almost everything. The combination was superb and was a big hit at the party. If you are hosting or contributing to a NYE shindig, these could be a great option. Enjoy! To make the dough, combine the flour and salt in the bowl of a food processor. Add the butter to the bowl and pulse until the mixture resembles coarse meal and the largest butter pieces are the size of peas. (The butter can also be cut into the dry ingredients with a pastry blender or two knives, or using a stand mixer.) In a liquid measuring cup, combine the eggs, water and vinegar. Add the liquid to the bowl with the flour mixture and pulse again until a shaggy dough forms. Turn the dough out onto a work surface and knead just until the dough comes together, adding a few extra drops of water only if necessary. Form into a disc, wrap in plastic wrap and refrigerate until well chilled, at least 2 hours. To make the filling, preheat the oven to 375˚ F. Slice the eggplant into ½-inch thick slices. Lay the slices out on rimmed baking sheets in a single layer. Brush lightly with olive oil, season with salt and pepper, flip and repeat on the other side of all the slices. Roast, flipping halfway through the baking time, until slightly soft and golden brown, about 35 minutes total. Transfer to a cutting board and let cool slightly. When cool, coarsely chop and transfer to a large mixing bowl. Line a now empty baking sheet with foil. Add the mushrooms, onion, bell pepper and garlic to the pan. Drizzle lightly with olive oil and season with salt and pepper. Roast until just tender, about 15-20 minutes, stirring once or twice during baking. After allowing to cool for a few minutes, add to the bowl with the eggplant. Let cool to room temperature. 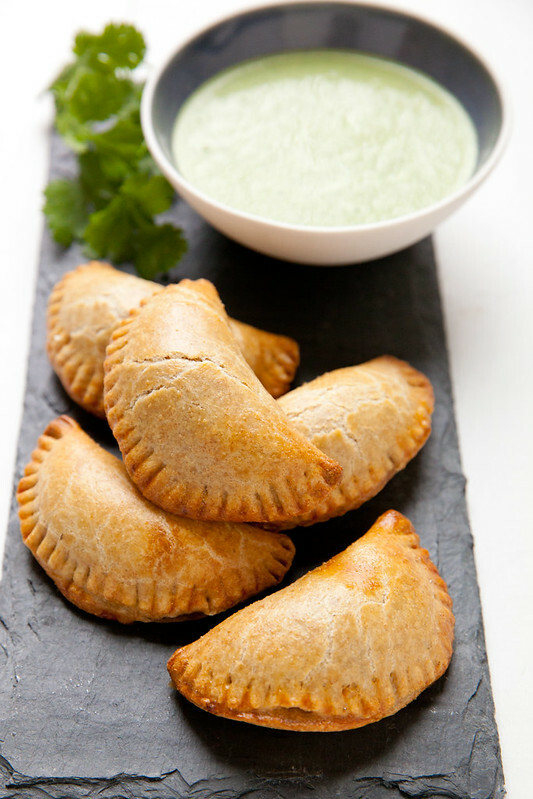 When ready to bake, heat the oven to 400˚ F. Place the shaped empanadas onto a baking sheet lined with a silicone baking mat or parchment paper. Brush lightly with the egg wash. Bake until golden brown and warmed through, about 16-20 minutes. Serve warm with garlicky green sauce or tomatillo salsa. * At this point, the assembled empanadas can be frozen on a baking sheet. Once frozen, transfer to an airtight storage container and freeze until ready to use. Bake straight from the freezer, no need to thaw. You may need to add a few minutes to the baking time to compensate.